​Most bicycle wheels are clincher-style wheels, in which pressure for riding is maintained not by the tire itself but rather by a replaceable inner tube between the tire and wheel rim. Having a good tube can be the difference between an enjoyable and fast ride, and spending the day fixing flats. In this article, we’ll cover everything you need to know about bike tubes and highlight the five best bike tubes for your next ride. ​The most important decision you’ll need to make in choosing a bike tube is what type of valve you need on your tube. Most tubes designed for road bicycling use what is known as a Presta-style valve, while most tubes designed for mountain biking use a Schrader-style valve. ​Presta valve tubes use a smaller diameter valve, which fits in the smaller valve hole found in most road bike tires – and which won’t fit larger Schrader valves. ​Schrader valves are typically easier to inflate and have easily removable cores in case you wish to put a flat sealant material into the tube. 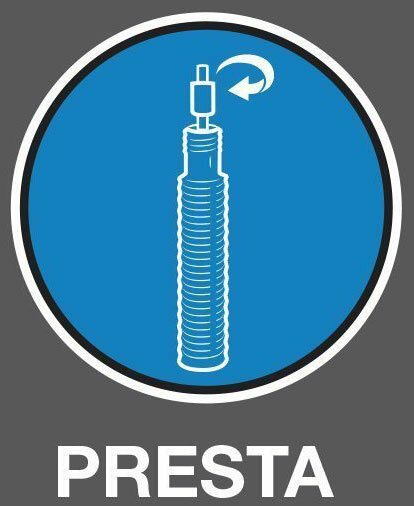 ​When purchasing Presta tubes, look for those with a removable core since this gives you the flexibility to add a valve extender or sealant if you so desire and they are often the same price as those without a removable core. The tube you purchase must also match the diameter of your wheel and tire. While most road bike wheels are 700c, other sizes do exist, and mountain bike wheels can vary dramatically in size. To determine the diameter of your wheel, check your tire – the number before the x symbol is the diameter. Another important consideration when purchasing a tube is matching the width of the tube to the width of the wheel and tire you plan to sandwich it between. If you purchase a tube that is too narrow, it will not fill out the tire when inflated, while a tube that is too wide will be spilling out of the sides of the tire. ​To determine the width of tube that you need, check the markings on your tire – the number after the x symbol is the width needed in millimeters. Many tubes come rated for a range of widths, such as 20-25 mm. Tubes are available in either butyl rubber or latex. Butyl rubber tubes are the most commonly used because they are relatively inexpensive and relatively durable. ​Plus, butyl rubber tubes can be easily fixed with a standard flat repair kit on the road. Many tube manufacturers also make a lighter weight butyl rubber tube for racing purposes. ​These tubes use a thinner layer of rubber to cut weight, but the downside is that they are typically more expensive and are more prone to punctures. Latex rubber tubes are the lightest of all, but also the most expensive and least durable. ​They can be difficult to fit onto a wheel without immediately pinching and ripping them, and latex tubes cannot usually be repaired with a flat kit once they are ripped. ​Plus, latex tubes leak air faster than butyl rubber tubes, so you’ll need to pump them more often. As a result of these downsides, latex tubes are typically only used for short races. ​The valves on both Schrader- and Presta-style tubes come in a variety of different lengths. For typically shallow-rim road wheels and most mountain bike wheels, any length of valve will work. ​However, if you have wheels with deep rims – which provide aerodynamic benefits – you will need to choose tubes with a longer valve length or valves with a removable core so that you can add a valve extender. ​If you aren’t worried as much about speed as you are about dealing with a flat tire out on the road or trails, it can be a good idea to add sealant into your tube. Sealant materials fill the tube after it is inflated and help to plug up small punctures after they happen. ​Adding sealant requires a valve with a removable core – all Schrader and most Presta valves – so that you can add 25 to 30 mL of sealant directly into the tube. Note that sealant will typically prevent tube patches from adhering to the tube if you do get a hole and sealant will not prevent air from leaking out of a large hole. In addition, sealant should not be used with latex tubes since it can degrade the rubber over time and cause the entire tube to fail. ​If you do end up with a flat while you’re out biking on the roads or trails, the easiest solution is to have a fresh spare tube that you can replace the punctured tube with. However, it is also possible to repair a tube after it has been punctured and simply put it back onto the wheel to keep riding. Any bike shop sells flat repair kits, which include butyl rubber tire patches and an adhesive to fix the patch onto the tube. To repair a tube on the go, first thoroughly inspect the leaking tube to find the puncture. Adding some air and listening for the hiss of escaping air can make this process easier. Once you have identified the spot where the tube is leaking, also check the spot on the tire that the leaking area was in contact with and make sure it is free of debris that could cause another puncture. ​Typically, repairing the punctured area of the tube with a patch takes 5-10 minutes of waiting for the glue to dry – and obviously requires having a hand pump or a CO2 canister to inflate the tube after it has been patched. ​This Schrader valve tube is extremely inexpensive, which can be a huge asset if you ride a lot and go through a lot of tubes. It is manufactured in a wide variety of tube diameters in order to fit nearly any bicycle wheel. The downside to this tube is that the valve stem is extremely short, at only 32 mm on most of the tube diameters. Although this may be long enough for many mountain bike wheels, depending on your pump head it may make it difficult to latch on to the valve in order to inflate the tubes. 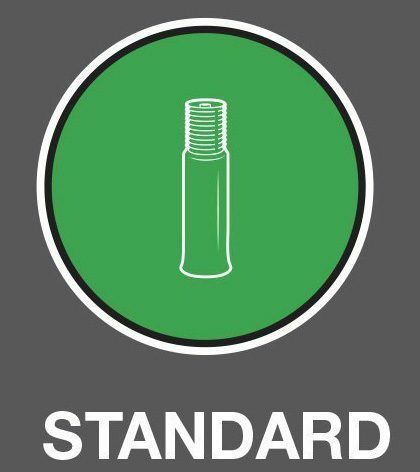 Only a few sizes come in standard 48 mm valve stem lengths, and only one size comes in a longer 60 mm length. In addition, this tube appears to have a common manufacturing problem that causes it to fail critically around the valve. Some tubes will spontaneously pop within hours of being inflated, regardless of whether they were actually ridden or not. This defect makes it difficult to trust any of the tubes, even the ones that don’t pop immediately. ​Inexpensive butyl rubber Schrader valve tube. ​Available in wide variety of tube diameters and widths. ​Valve stem is only 32 mm long for most sizes, which can make fitting pump head onto valve difficult. ​Common manufacturing defect causes tube to rupture around the area of the valve even before it is ridden on. This in turn makes it difficult to trust this tube for riding on roads and trails when failure can be dangerous. ​This butyl rubber Schrader valve tube from Bell is designed to be universal – but only if your wheel will fit the limited range of sizes. The tube comes in only range of widths for each diameter class, which means that many wheels will not be able to use this tube. In addition, Bell decided to measure the tube widths in inches, while most wheel widths are measured in millimeters – an easy conversion, although this can be the difference between ordering a tube that fits and one that doesn’t. If the tube does fit your wheel, however, it is a reasonable quality rubber and should last for many miles. The Schrader valve head is durable and the tube is plenty strong to hold sealant without causing degradation issues. The tube is slightly cheaper than competitor Schrader valve tubes, which can make a big difference when you are buying multiple tubes. ​Uses a durable Schrader valve. ​Thick butyl rubber will last for many miles. ​Can hold sealant without degradation of the rubber. ​Tube is slightly cheaper than other Schrader valve tubes. ​Only available in one width range for each tube diameter, which means it will not fit many wheel sizes. ​Dimensions are measured in inches, which increases confusion when sizing tubes. ​The Continental bike tube is a classic – it is the same tube you’ll find sold at many local bike shops and in the wheels of nearly all road cyclists during training rides. The tube is primarily available in three diameters specific to road wheels – 26”, 29” and 700c – and comes in a variety of widths for each diameter class. Although Schrader valve tubes are available, their size availability is limited and this is primarily considered to be a Presta valve tube. The 42 mm valve stem is long enough for most road wheels, and a 60 mm version is available for most of the tube sizes for riders with deep rims. Plus, all of the Presta valve cores are removable in case you need to add a valve extended. The tubes themselves are made of butyl rubber and are highly durable, if somewhat heavy for racing purposes. ​Comes in a variety of standard road wheel sizes and a range of widths for each size class. ​Available in long 42 mm and 60 mm valve stem sizes and core is removable for adding a valve extender. ​Highly durable for road riding over many miles. ​Somewhat expensive compared to other Presta valve options. ​Schrader valve options are limited. ​Thick butyl rubber is somewhat heavy for racing purposes. ​This Schrader valve tube comes pre-filled with Slime, a market-leading sealant that drastically reduces the air leakage following a punctured tube. The tube itself is made of extra thick butyl rubber to be even more resistant to punctures in the first place and to resist degradation of the rubber from the sealant over time. The sealant inside remains fluid for up to two years of use, although frequent riders are likely to go through tubes at a much faster rate than that in any case. The disadvantage of the Slime-filled tube is that in the case of large holes, the tube cannot be patched with a standard flat repair kit because the patch will not stick to the tube. In addition, the tube is only available in one size – despite the fact that mountain bike wheels come in a variety of diameters and widths. In many cases, it may be more cost effective to simply buy the tube and Slime sealant and fill the tube yourself. ​Pre-filled with Slime sealant to instantly seal small puncture holes. Sealant is good for up to two years. ​Extra thick butyl rubber to prevent punctures from happening. ​Only available in one diameter and width, despite the variability in mountain bike wheels. ​Large holes will not be capped by sealant and cannot be patched with standard repair kit. ​More expensive in the long run than purchasing tubes and sealant separately and filling the tube yourself. ​This Schrader valve tube from Goodyear presents a nice combination of price point and options in terms of tube sizing. The tube is available in most standard wheel diameters, although some diameters only have a limited range of widths manufactured. The tube itself is constructed out of durable butyl rubber for putting in many miles without flats. ​However, like many inexpensive tubes, this tube suffers from manufacturing defects in which a significant number of tubes leak air on their first use or develop a puncture around the base of the valve. ​Although careful placement of the tube on the wheel can partially mitigate the latter, the manufacturing issue can be infuriating when a new tube fails to hold air. ​Reasonable price for a Schrader valve tube. ​Available in most standard wheel diameters. ​Constructed from durable butyl rubber. ​Some diameter size classes only have one tube width available. ​Manufacturing defect in which tube leaks air on first use or develops puncture around base of valve is common. ​What size tube do I need? ​Determine the size of tube needed for your wheel by checking the markings on the outside of your tire. 700 x 25, for example, means you need a 700 mm diameter tube with a width of 25 mm. ​What valve type do I need? ​Most mountain bike wheels use Schrader valves, while most road bike wheels use narrower Presta valves. When in doubt, measure the width of the valve opening in your wheel. ​What valve length do I need? ​Unless your wheels have deep rims, the valve length will not matter. When in doubt, look for a tube whose valve has a removable core so that you can add a valve extender if needed. ​The overall best bike tube in the roundup is the Universal inner tube from Bell. ​Although it comes in a limited range of diameters and widths, for those sporting wheels that this tube will fit the tube comes at a bargain price and is very durable thanks to the thick butyl rubber. The Schrader valve has a stem length of 35 mm – enough room to fit a pump head onto for most mountain bike wheels – and the removable core allows you to add sealant after market or to add a valve extender when needed. These features, combined with the excellent price, made this the best bike tube on the market for those in search of a Schrader valve tube.